To-date we have featured the experiences of University of Western Australia student, Christian Berger; Queensland University of Technology PhD candidate, Thomas Noble; University of Melbourne student, Kimberly Pellosis; Luisa Olmo from the University of Sydney; and most recently Rachael Wood from Charles Sturt University. 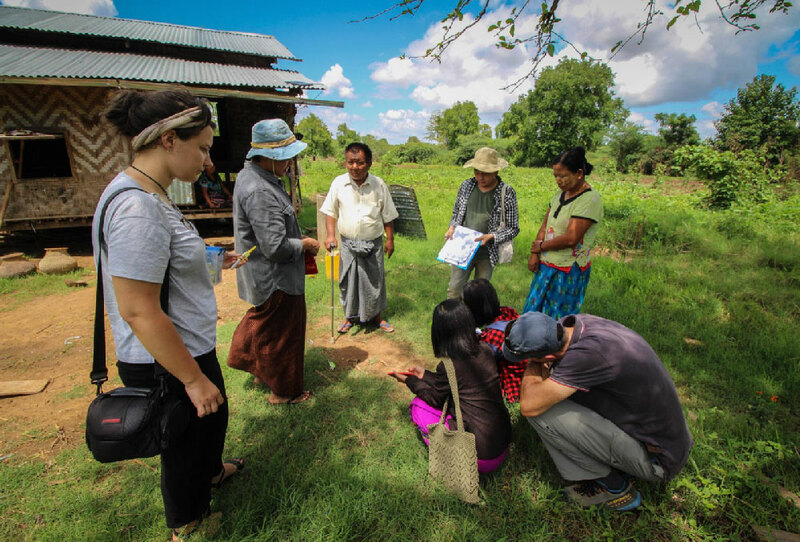 Now, thanks to The Crawford Fund Victoria Committee, we deliver this summary of University of Melbourne student Ziyang Loh’s experience connected to an ACIAR project in rural Myanmar. In September, Ziyang Loh, a veterinary student from the University of Melbourne travelled with a group to Myanmar as part of his research supported by the Crawford Fund Student Award. Here they were joined by a team from a local University of Veterinary Science (UVS) team in Yezin who would later accompany them on all their village visits. Myanmar’s Central Dry Zone (CDZ) has limited rainfall and is particularly harsh for agricultural producers, yet a large proportion of the country’s agricultural population (and their animals) reside in this area. The goal of the work in which Ziyang was involved was to run pilot surveys and surveillance to pave the way for future research associated with the ACIAR project on improving livelihoods of small-scale livestock producers in the region through research on animal production and health. This involved interviewing livestock farmers to gather information on the socioeconomics of their household and assessing the overall health of their herd through a visual veterinary assessment and collecting blood samples for further evaluation. “Whilst this trip provided plenty of opportunities for data collection, it also allowed us to experience first-hand how different production systems operate in this country. The Myanmar hospitality did not go unnoticed, and we were very grateful for the refreshments and responses the villagers provided us during our survey work”, said Ziyang. Prior to their field work, Dr Angus Campbell and Dr Jenny Hanks, both from the University of Melbourne, ran a brief workshop on how to interview farmers and how to process blood samples. Together with the UVS team, the participants practiced producing blood smears, using a refractometer and learning about centrifuges. The group interviewed farmers in three areas in the CDZ – Meiktila, Myingyan and Natogyi. Farmers were interviewed about the ownership and management of goats and sheep to allow researchers to gain an idea of the overall size and make-up of an average village flock; who was involved in the husbandry and important decision-making with regards to the flock including who decided when to buy and sell the animals and how the profits were used. The farmers were also asked about whether they had any issues with certain tasks such as the price they received for livestock and labour availability and any diseases that they thought were an issue on their farm. Once the survey answers had been recorded, the villagers were thanked, and their permission was sought by the researchers to observe their flock and to take two blood samples. Any abnormal clinical signs were recorded. supervise UVS students as they practice making smears from a blood sample. The blood samples taken at the villages were processed back at the hotel on the same day to ensure cell preservation and accurate results. To ensure the blood smears we prepared would survive the trip back to Australia, we dipped them in 70% methanol to ‘fix’ them onto the slides. 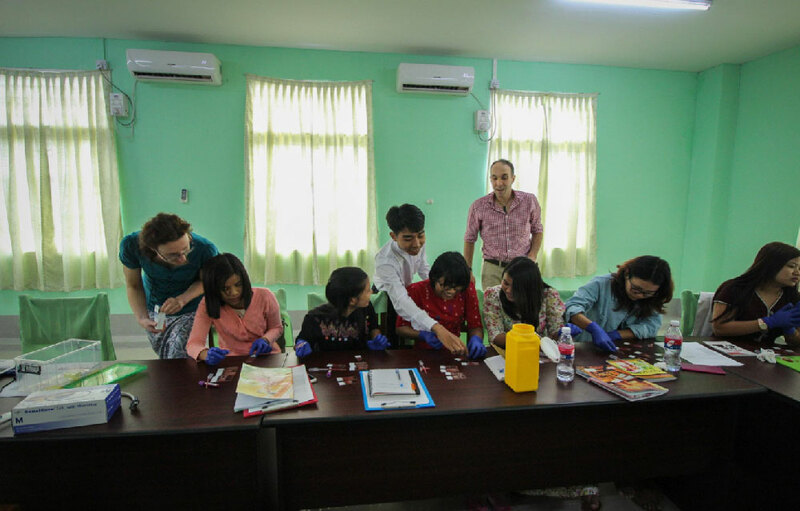 “This trip to Myanmar provided a unique opportunity to work alongside the current and future veterinarians of Myanmar. Together, we consolidated critical thinking and practical skills required to perform veterinary research to a high level,” said Ziyang. “I would like to thank the following groups and individuals for the hard work and support they provided during the trip: Dr Angus Campbell and Dr Jenny Hanks (University of Melbourne) for organising a once in a lifetime opportunity and trip; The Crawford Fund for providing the scholarship funding required to travel to Myanmar and conduct veterinary research; the University of Veterinary Science (Yezin) for their assistance in translating interviews and sample processing; the Faculty of Veterinary and Agricultural Sciences (University of Melbourne); ACIAR; and my fellow DVM classmates who accompanied me on this trip. Many interesting discussions and experiences were shared between the four of us,” he concluded.